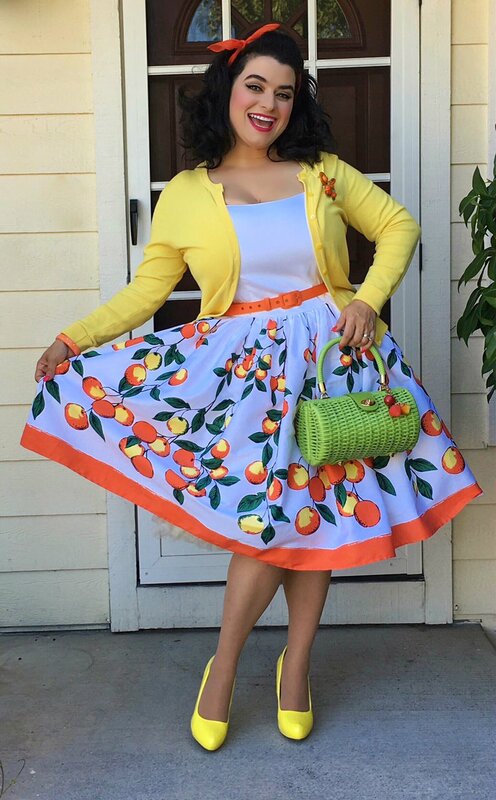 Bright, happy, elegant, effortless, and colorful are all words I think of when I where this dress the Pinup Couture Jenny Dress in Orange Border Print and I am so happy I snapped it up when it was restocked at Pinup Girl Clothing. The print is amazing, one of the best novelty prints I have ever seen. Reminds me of 1950s Florida and I love that the oranges range in colors of yellow to bright orange and go from small to bigger on the hanging branches. In these pictures that my wonderful hubby who does amazing things with vintage cameras over at Upcycled Classics snapped of me, I have my Pinup Couture Wicker Baguette Purse in lime green and added a simple yellow cardigan. I felt glamorous and chic, like I was on the Riviera. 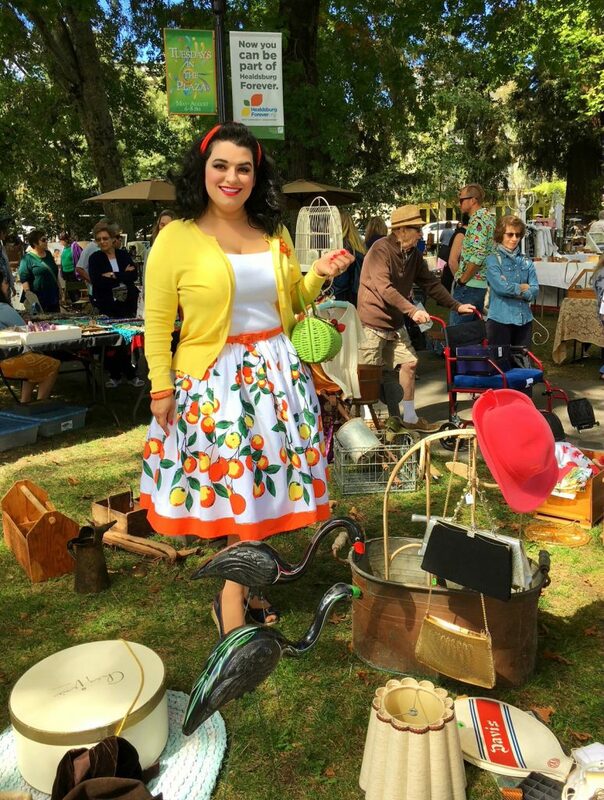 We snapped some pics on the front porch with fluffy puppy Luna then headed to a lovely outdoor antique and collectible show. I was comfortable and relaxed and received so many compliments. The Jenny dress is one of my wardrobe staples and I don’t have nearly enough!! When you are a full-busted gal like myself it is very hard to find dresses that fit, have style, and have such great novelty prints and that is why the Jenny is a staple for me. I always feel put together and effortless. The dress is styled after the 1960s sundresses. The first thing you notice when you step into the dress is that the bodice is lined, boned, and fused. The lovely orange colored straps are adjustable so you can show as much or as little of your curves as you are comfortable with. Because of the adjustable straps and boning, the dress has incredible structure and will flatter a range of bust sizes, even those of us blessed with full-bust lines can comfortably wear this gorgeous dress and feel very put together and chic. 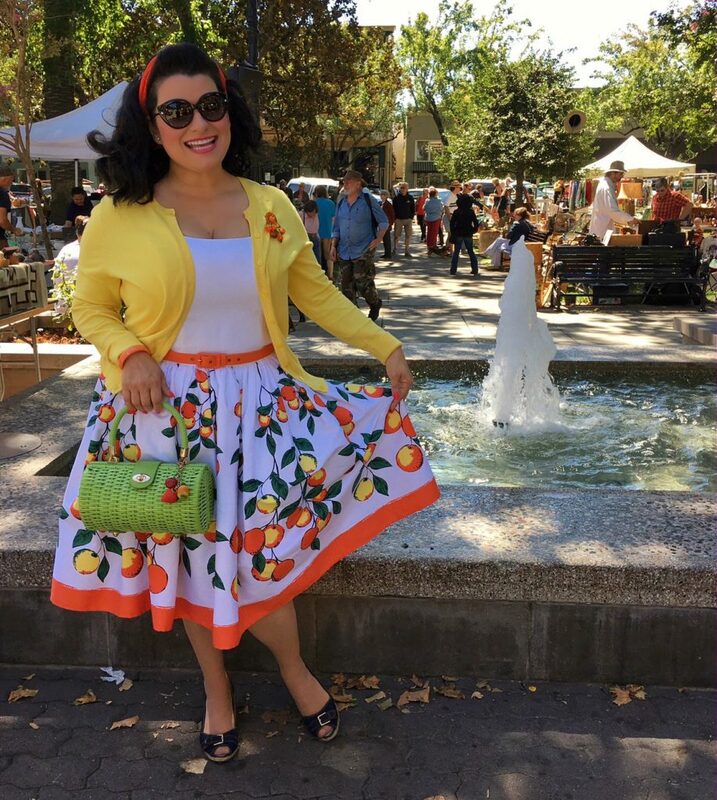 The skirt on the Pinup Couture Jenny Dress in Orange Border Print is much like the Jenny skirts, a very full circle skirt and the material is a luxurious sateen that holds pleats and shape incredibly and this version even has pockets!! Zips nicely up the back and nips in your waist. Also, this one comes with a matching orange belt and that adds just the right amount of flair. Be prepared for lots of compliments!! I am wearing the Jenny Dress in Orange Border Print in a 2XL (all my Jenny dresses are 2XL) and this size accommodates my full bust, yes, it is very roomy in the waist as I take XL in Jenny skirts but I love having the option of adding a belt to take in some of the excess fabric if I prefer, depending on how much waist definition I want that day. 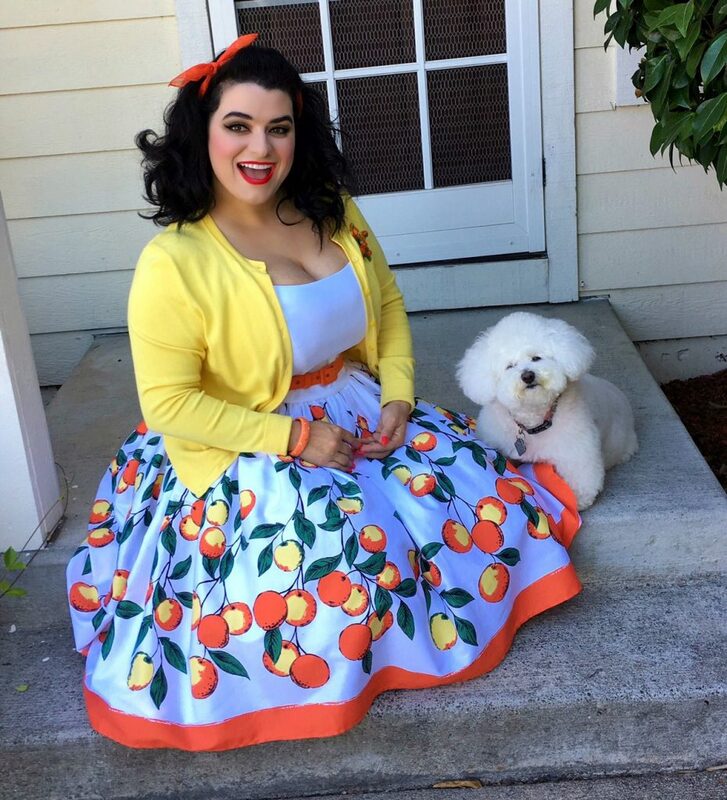 Hurray and snap up the beautiful Pinup Girl Clothing Jenny Dress in Orange Border Print while sizes are in stock, you will be happy with it! !